Stark ,53, “saved lives and took action even after being harmed,” said Seattle Mayor Jenny Durkin. The events unfolded at about 4 p.m. Wednesday in Seattle’s Lake City neighborhood, when the gunman walked up to a 56-year-old female driver, shooting and wounding her. The man, who police had still not identified Thursday, then walked on and fired at the bus, hitting Stark, authorities said. The gunman then approached a second motorist and opened fire, police said, killing a 50-year-old man. After officers arrived, the suspect fled in the that victim’s vehicle. He drove a few blocks and then collided with another car, killing the 70-year-old male driver, fire department officials said. The 33-year-old suspect was taken into custody after a brief standoff. He was transported to a hospital with minor injuries, police said. Witness John Barrett told the KOMO television station that he was in his garage when he heard what sounded like fire crackers. None of the passengers aboard the bus driven by Stark were hurt, the King County Metro Transit agency said. Stark managed to get off the bus and walk to a gurney so paramedics could take him to the hospital, said Kenneth Price, president of Amalgamated Transit Union Local 587, which represents drivers. 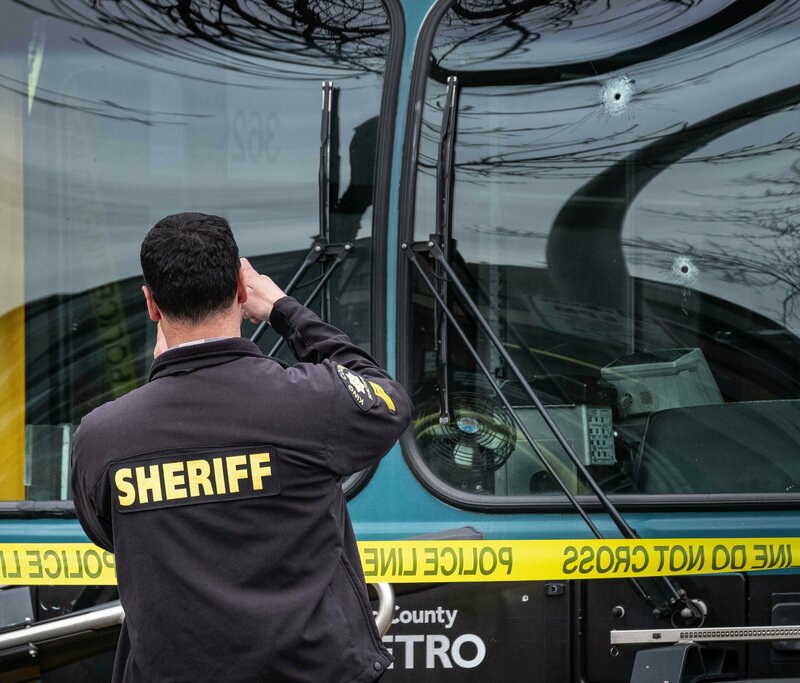 Stark has worked for the transit agency seven years and “acted heroically in the face of extreme adversity to protect his passengers,” said King County Executive Dow Constantine said has worked for King County Metro for seven years. Stark, the woman who was shot and the suspect were taken to Seattle’s Harborview Medical Center. None suffered life-threatening injuries, said hospital spokeswoman Susan Gregg.